Biotin. We hear a lot about it when it comes to hair and hoof growth. But what is biotin and how does it work? Also known as Vitamin B7 or Vitamin H (for hair), biotin is responsible for the synthesis of keratin, a hard, structural protein essential for hair and hoof production. The body needs biotin to metabolize carbohydrates, fats and amino acids, the building blocks of protein. However, biotin, especially when combined with zinc, will enhance skin, hair and hoof quality in your show livestock. “If you want to grow hair, the skin has to be healthy. They all go hand-in-hand. Biotin is very essential to skin, hair and hoof growth. However, you also have to have good management and the proper genetics to grow hair as well,” said Lindsey Grimes-Hall, BioZyme® Inc. Nutrition & Field Sales Support. 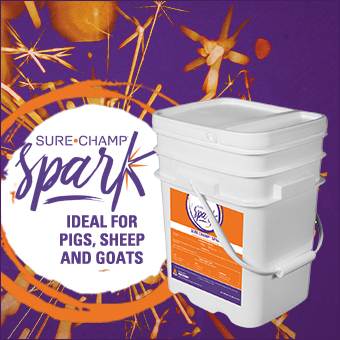 Because of the importance of keeping skin, hair and hooves healthy in show livestock, Sure Champ® has added biotin and zinc to Sure Champ Spark® and Sure Champ Extreme with Climate Control. Sure Champ Extreme is a pelleted, daily supplement with the Amaferm® advantage for show livestock that can be top-dressed or mixed in the ration to promote appetite and digestive health. It contains plant extracts to help maintain normal body temperature. It also includes biotin and zinc to support hoof and coat care. “We all know to stimulate hair growth, it helps to rinse your calves multiple times a day. Just running that cold water on the calves creates circulation and promotes stimulation for hair growth. We also know that Sure Champ Extreme and the plant extract in it works as a vasodilator, helping with blood flow so the combination of the cold water and the extract can amp up that hair growth even more. Biotin is a supplement to improve the integrity of the hair growth. It’s like a 1-2 punch,” Grimes-Hall said. Grimes-Hall reminds readers that in addition to good hair care management and biotin, it helps if the animals are genetically predisposed to grow hair. For example, you can rinse a Brahman-influenced steer and feed it all the recommended biotin and other popular hair growth stimulants on the market, but it still won’t likely grow hair like a calf out of a club-calf sire. Biotin is an ingredient with many uses. It keeps the skin healthy, and along with good management will help prevent dry or flaky skin. It prevents hooves from cracking and keeps them growing, and it promotes healthy hair growth on your show animals. 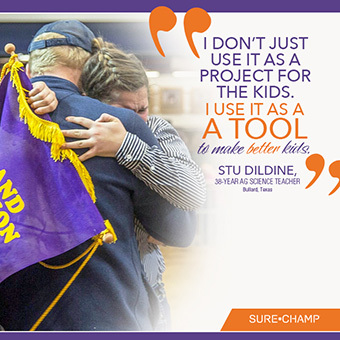 A combination of proper management – good rinsing, conditioning and brushing – with Sure Champ Extreme that contains biotin and zinc will keep your show animals looking their best as you prep to win.